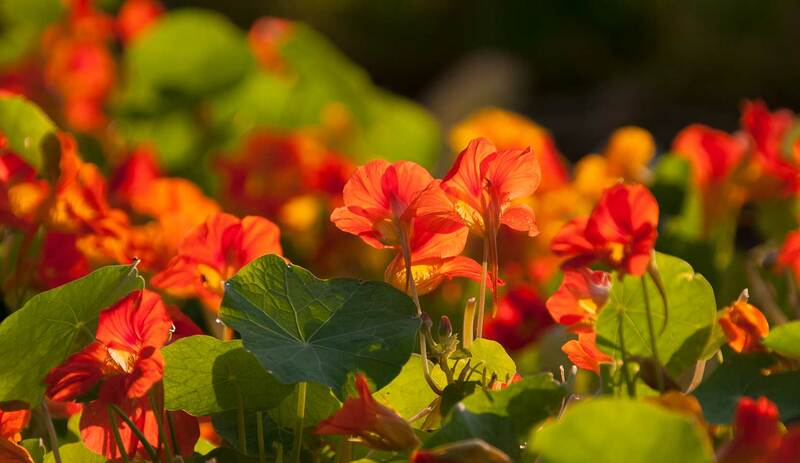 Scientific Name: Tropaeolum majus L.
The luxuriant growth of the nasturtium is a true joy for all garden lovers. Branching out in all directions it reliably and quickly covers bare patches and whole balcony balustrades with lush green and, from May to the first autumn frosts, delights the onlooker with a wealth of large yellow to orange flowers bearing a prominent spur. After flowering, the fruiting stalk bows towards the earth and conceals the ripening seeds in a cool, moist place. The round leaves, with the leaf stems at the center, are also highly decorative, their shape reminiscent of floating leaves. Drops of water collect like precious beads at their center and in cool nights water is secreted by the pores (hydathodes) at their edges. The whole plant is succulent and soft, without woody structures, and therefore grows close to the ground or hanging over balconies. It can only grow upwards with the support of fences or hedges. However, this softness and succulence makes it extremely susceptible to frost which causes it to wilt almost completely. In its native habitat, the Andes, the water-loving nasturtium grows naturally close to the rivulets on the mountain slopes. In its native countries knowledge of the healing powers of the nasturtium is very old. There the fresh leaves are used even today for treating all kinds of injuries, particularly inflamed wounds. This application is based, amongst other things, on the antibiotic action of the benzyl mustard oil which is effective against viruses, bacteria and yeasts and also strengthens the body's own defensive powers. This is why in our part of the world nasturtium is also used to treat infections of the kidneys, the lower urinary tract and the airways and for activation of the immune system. In folk medicine the fresh leaves are used in a blood-cleansing spring salad or, as in Peru, as cooling wound compress. Too much of a good thing is rarely beneficial. Thus, excessive consumption of the fresh leaves can cause irritation of the gastrointestinal tract and the kidneys. There is no risk of such side-effects when precisely dosed medicinal preparations are used. However, attention should be drawn to the reduced alcohol tolerance. The name Nasturtium indicum or Indian Cress comes from nasturcium which was the ancient Latin name for a particular kind of cress. The word cress, on the other hand, is derived from the Latin crescere - to grow, referring to the rapid growth of the plant. The French, German and Spanish names of nasturtium all derive from the Italian cappucio "hood; especially a monk's cowl"; the name was given because of the resemblance of the spurred flowers to the cowl of a Capuchin monk. The Latin name Tropaeolum is derived from the Latin tropaeum which means the trunk of a tree hung with battle spoils (such as weapons and armor) and is also the origin of the word trophy. If we see the leaves as shields and the flowers as helmets the origin of this name becomes clear. The nasturtium was not introduced to Europe until 1684. For a long time it was used only as an ornamental plant, later in spring salads for blood cleansing. Incidentally, the unripe buds and seeds can also be preserved in vinegar and used as a substitute for capers. In its native countries the nasturtium is pollinated by humming birds which dip their beaks deep into the spur in order to reach the sweet and slightly pungent nectar. The nasturtium appears to combine in itself irreconcilable opposites. The succulent leaves have a close affinity with the earth and are a strong expression of the aqueous element. They are topped by the flowers like little crowns of fire which, almost like little playmates of the humming birds, also have a bird-like, airy quality. Water and fire are also combined within the nasturtium, all the cells being filled with a water-soluble form of the sulfuric, fiery benzyl mustard oil, as well as on the outside, its natural habitat being in hot tropical countries but always close to water courses. Taken internally, nasturtium acts mainly on the lungs, kidneys and bladder, organs which are particularly closely concerned with the interplay of air and water. With its esthetically pleasing harmony of opposites, the plant appears to have a regulating effect on these organs. In the same way it helps the acne-plagued skin in which overproduction of the sebaceous glands as excessive fiery reaction and hardening and congestion of the pores as the opposite reaction lead to this troublesome skin condition. The nasturtium has learned to tame the fiery element and, with this knowledge, helps the skin to regulate itself again. The regulating powers of nasturtium help problem skin in the Dr.Hauschka preparations Clarifying Steam Bath, Clarifying Toner, Melissa Day Cream, Clarifyring Intensive Treatment (up to age 25) , and Clarifying Clay Mask .